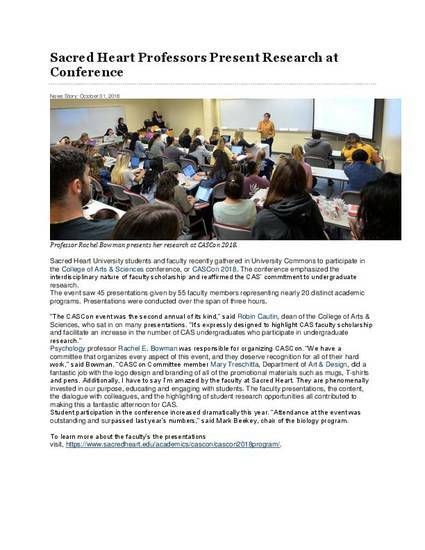 "Sacred Heart Professors Present Research at Conference"
Sacred Heart University students and faculty recently gathered in University Commons to participate in the College of Arts & Sciences conference, or CASCon 2018. The conference emphasized the interdisciplinary nature of faculty scholarship and reaffirmed the CAS’ commitment to undergraduate research. The event saw 45 presentations given by 55 faculty members representing nearly 20 distinct academic programs. Presentations were conducted over the span of three hours. Sacred Heart professors present research at conference (31 October, 2018). Sacred Heart University news story.